The Palazzo Cini Gallery at San Vio, the museum house that was once Vittorio Cini’s home, welcomes another illustrious guest: the Madonna of Pontassieve by Fra Angelico (Vicchio di Mugello, c. 1395 – Rome, 1455), a masterpiece from the Galleria degli Uffizi, Florence. The painting dates from the last years of the artist’s career and was probably the central panel in a polyptych in a church in the Tuscan town of Pontassieve. Thanks to significant collaboration with major Italian and foreign institutions, the initiative “A Guest at the Palace” involves the Gallery in periodically hosting a special guest art work with the idea of creating a dialogue with the works in the permanent collection, based on an interplay of visual relations and content. The painting will be unveiled in the Palazzo Cini on 17 June 2015 to coincide with the opening of the exhibition Piero di Cosimo. 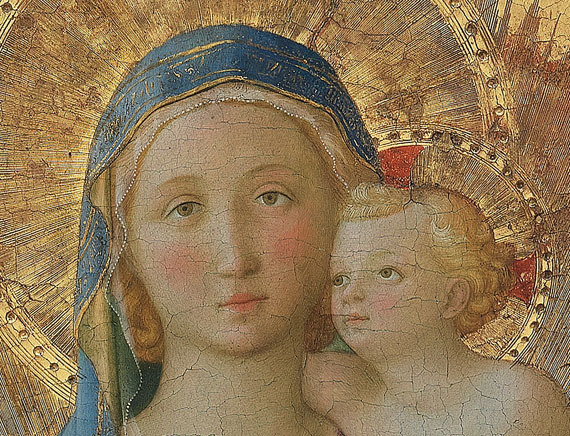 Pittore “fiorentino” eccentrico tra rinascimento e maniera (Florence, 23 June – 27 September 2015), which will feature two paintings by Piero di Cosimo normally on display in the Palazzo Cini Gallery: the Holy Family with Young St John and the Madonna and Child with Angels (recently shown in the exhibition Piero di Cosimo: The Poetry of Painting in Renaissance Florence at the National Gallery of Art, Washington).